Hiking thru the many trails at Fall Creek Falls can make a great day out in nature, but have you done a ROCK HOP? This is one of the most fun adventures to take while at the park!! Start at the Nature Center crossing the suspension bridge to the Woodland (brown) or Gorge Overlook (black) trails to the big falls overlook and hike down to the bottom of the waterfall. 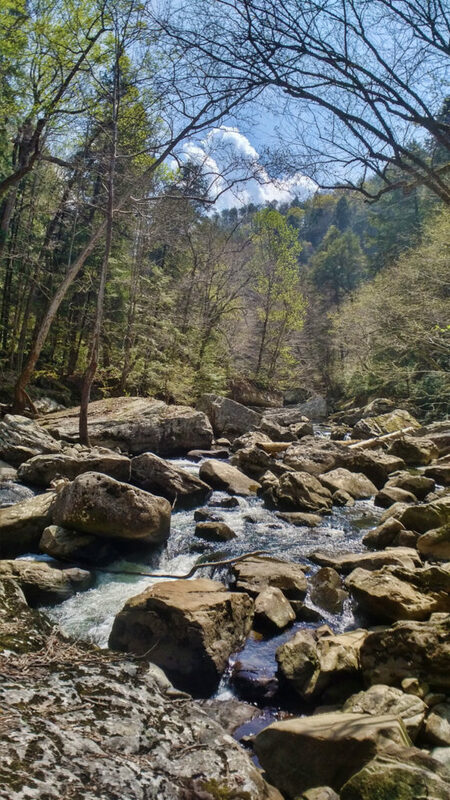 Then make your way downstream to Cane Creek and turn right going upstream hopping from rock to rock making your way to Cane Creek waterfall. Just before the plunge pool of Cane Creek Falls on the left, is the Cable Trail (silver) that will lead you back to the Nature Center where you can rest from your Rock Hop watching a video in the theater room! !